O. O. Workshop: Useless, impractical, embarrassing? Give us objects you want to get rid of! Service Profile: Object destruction workshop. The object provided is destroyed according to a ritual of the owner’s design. Remarks: The O. O. Workshop invites the public to empty its overloaded daily life. The preliminary phase, consisting of talking about the why (and the how, a genuine moment of reflection on ‘less’) of the destruction of the object, is essential. Excerpt from an IKHEA letter describing the realisation of the O. O. Workshop during the 2003 Nuit Blanche (an all-night cultural event in Paris): ‘ . . . with IKHEA©SERVICES, devoted to reducing productive consumption, we have turned to the idea of “subtractive services” which openly attack merchandise. Services which, because they are theoretically executed without a public (directly in the client’s home and in that person’s presence alone), should permit those who realise them to do without intermediaries (the market, the stage) as much as possible. 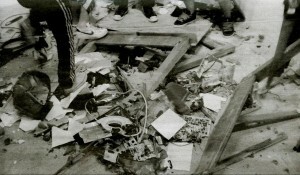 The O. O. Workshop during the Nuit Blanche consisted of proposing an ‘Out of Order’ area for destroying consumer goods. By definition, however, the Nuit Blanche (a high-visibility operation open to a very large public) precluded a number of circumstances favourable to the realisation of the services indicated above (working without an audience, modestly, in direct relationship with the client). To keep the O. O. Workshop from turning into a spectacle, it was necessary to adopt an extremely diligent attitude during the execution of the service and remain both measured and precise in the destructive act. The mechanism was very simple: a text distributed in different forms and placed on the City of Paris website invited the event’s potential public to come and meet us at any hour of the Nuit Blanche with an object they wished to put out of order/destroy. On site: a crew composed of one leader and three assistants (‘executioners’), a selection of basic tools (saw, sledgehammer, pliers), several tables (‘execution blocks’) and a giant dustbin. Two essential details concerning the execution: with the approach of the final phase-loss, dispossession-the owners chose the scenario for the destruction of the object they brought. The object destroyed could not be retrieved, it had to be thrown away. A quick overview of the reactions recorded during this realisation: 1. Client X quite judiciously neutralised the O. O. Workshop saying that she only owned things she used and thus could not provide us with anything. Indeed, the project (doing more with less), draws its meaning from the idea of bringing out the absurdity of the superfluous and thus could not (and should not, at the risk of decadence) be carried out in a situation where the basic essentials are lacking. It is aimed at the overloaded Western society. 2. Many people wanted to keep the broken, burned, etc. remains with the idea that giving up an object of value would permit them to acquire an object of art. In order to discourage them, the demolished objects, without exception, all wound up in the trash. 3. What if it were beautiful? In a strategy of neutralising the extremely fascinating aesthetic dimension of destruction, we attempted to minimise as much as possible the final (and ultimately ordinary) act by placing the emphasis on everything preceding it: the original, intimate dialogue undertaken with the object’s owner. 4. How to distinguish this action from sacrifice? Prerequisites: A homogeneous, measured crew. Filiations: Gustav Metzger; Éric Watier. The O.O. Workshop is property of FRAC Poitou-Charentes and was activated with the generous autorisation of this institution. 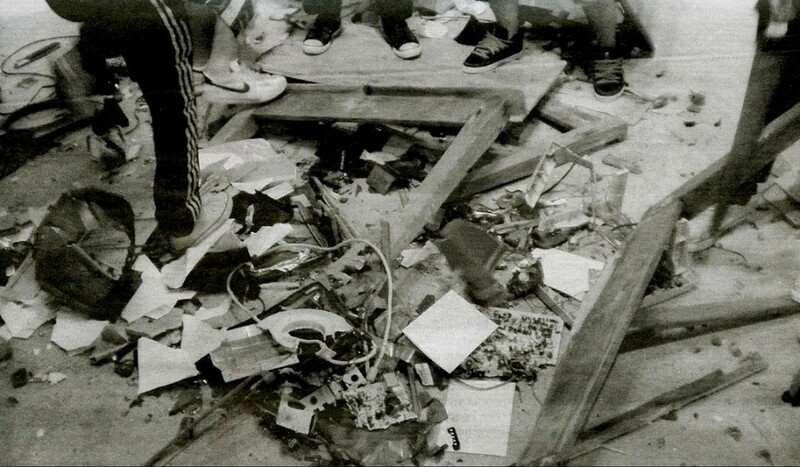 Service Profile: Destroying goods in the store where they were just purchased. Six buyers, trained by Jean-Baptiste Farkas a few days prior to the activation of the service and provided with a capital of 60$, will select a store in Montreal. In these chosen locations, the buyers will select merchandise that will purchased before being destroyed in that same store in front of the cashiers (and/or managers of the store). Buyers must be careful to not damage anything except the selected merchandise. Seeking outbursts! Ideally, this activation could constitute the beginning of a number of spontaneous activations of Buying/Breaking perpetrated in Montreal. This website is licensed under a Creative Commons Attribution-NonCommercial 3.0 Unported License. The work of individual artists may be subject to different terms.